Acne laser treatments are the newest method for eliminating the scars associated with moderate to severe acne. Anyone who has experienced the pain and embarrassment of acne can understand why laser treatments look so promising, but do they work? Acne is one of those really dreaded skin problems that occurs most often in adolescence, but also can continue well into adulthood for some people. Acne can also flare up during periods of hormonal changes such as menopause, or in response to stress. For more about acne, please see our What Causes Acne page. Now, those of us with sensitive skin might get visited by an acne breakout at any time. I'm well into my fifties and I STILL get acne occasionally if I try a new skincare product or go too heavy on my natural anti-aging skincare products which are high in "bioactive" ingredients. I even get acne if I use too many different types of skincare products at one time! Why Use Acne Laser Treatments? Generally acne laser treatment is recommended for more severe cases of acne if other acne treatments have not been effective such as topical creams, dietary changes and homemade acne treatments. One research study estimated that nearly fifty percent of people who are able to modify their diet (see foods that cause acne ) will see some improvement in their acne, however for those situations where acne does not respond, acne laser treatment is a good option to consider. How Does Acne Laser Treatment Work? 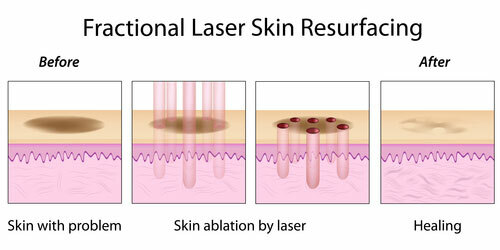 Surgeons use tiny lasers to target the affected areas of the skin and remove the damaged areas of the skin, leaving the unaffected areas completely alone. The removal of the damaged skin allows new skin to emerge, leaving your skin scar and acne free. The surgeon can adjust for skin type and skin tone, so it's possible for people with all skin types to take advantage of laser treatment. 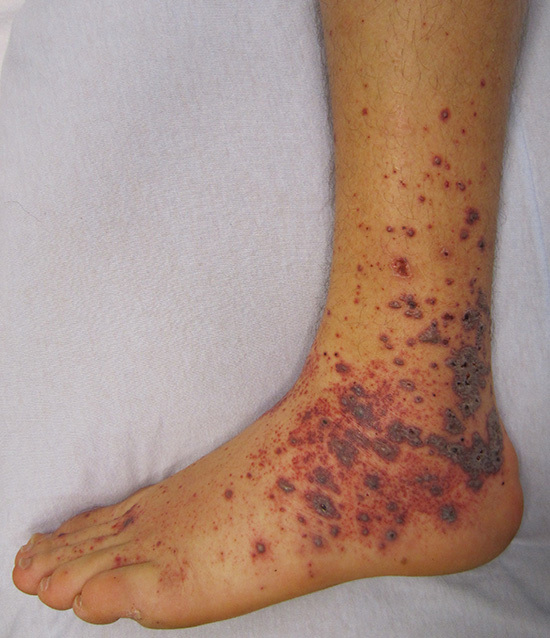 After the treatment, it may take up to three weeks or more for your skin to heal. People with fair skin may see redness on their face for up to six months. There are different types of acne laser treatments available, and more research needs to be done to verify their effectiveness. These are used for acne scar removal. Ablative Laser Procedure - heat is used to burn the top layers of skin in an effort to create tighter skin that appears to be more flawless. People with keloids or raised scars can often benefit from this type of laser surgery. This is also known as Infrared laser treatment and is used for more severe cases of acne. One non-controlled research study showed an 83% decrease in acne, however more research is needed. Non-ablative Laser Procedure - otherwise referred to as cold laser treatments, the surgeon uses a light of high intensity to reduce the secretion of oil under the skin. As a result, the collagen in the skin is activated and seems to fill in the deeper areas of the skin that have been affected by acne scarring. The Erbium:YAG cold laser is one type of cold laser which many doctors believe works better than the Carbon Dioxide (CO2) cold laser because it allows for more delicate and detailed application, and with fewer complications. Doctors who prefer the CO2 lasers say that these work better for aging and sun damaged skin. Pulsed-dye laser therapy is used for treatment of rosacea, varicose veins and other vascular skin problems, but has demonstrated less favorable results for acne treatment. Some research studies suggest that it simply does not work for acne. These treatments hope to prevent future acne scars from forming by halting the outbreak of acne. Blue-light therapy focuses on killing the bacteria that are thought to produce acne. The patient receives eight sessions of 15 minute treatments, done twice a week. Pulsed light and heat therapy is intended to both kill bacterial and also reduce excess sebum production in the skin, and research on this method appears promising. How Effective Are Acne Laser Treatments? Most often, physicians will begin treating acne by way of topical creams and lotions and other traditional therapies. When those aren't effective, laser treatments can be an option for some patients. Physicians will prescribe these cutting edge procedures for those who suffer from severe acne or have scars they would like removed. Even though these treatments are expensive and intense, they usually need to be repeated more than once, and often several times, in order to achieve the desired results. So far, there is limited research on the effectiveness of acne laser treatments and results have been . and there has not been a clear consensus that this treatment really works. Every surgery is accompanied by its own set of risks and potential dangers. Laser treatments are no different, and because the treatments are still relatively new, there are additional risks involved. For example some laser machines have had to be recalled because they produced severe burns. The potential risks associated with these procedures include redness of the affected skin, swelling in the areas that were treated, tenderness, and some pain for a short time following the surgery. Patients with darker skin can potentially incur darker spots on the treated areas of the skin. It's rare, but does happen in some cases. Other people have developed new scars that did not go away. Of course, one of the biggest drawbacks of these acne treatments is the cost. They're expensive! These treatments are also usually not covered by insurance. The best way to minimize the risk is to choose your laser specialist VERY carefully. I recommend you work with a dermatologist, rather that simply a laser specialist. Choose a doctor who is experienced with doing this kind of treatment, and be sure to check their credentials. Meet with them beforehand to learn more about what to expect, and be sure that all your questions are answered. Talk to other patients that have been treated by the doctor. What results did they have? Do some research about the laser procedure your doctor recommends, so that you are informed and educated. Follow all the recommended instructions before, during, and after your laser treatment. What is the cost of beautiful skin that is free of acne or scarring? You can expect to incur costs of $2,300 to $3,200 for just the laser treatment. Additional costs might include the fee for the anesthesiologist, the operating room, and any other expenses incurred during the surgery. Acne laser treatment is not an inexpensive solution, but it's still a viable one for those who are simply tired of living with the scars of acne. More and more people who haven't responded to chemical peels or dermabrasion are turning to laser treatments in order to have the clear skin they've always wanted. There are several acne treatment options that are extremely simple AND very affordable that you may want to consider before you go ahead with acne laser treatment. One is this very simple Acne Sensitive Skin Treatment program that uses just four hypoallergenic, non-toxic skin care products. Before you decide on acne laser treatments, you may want to consider some more natural approaches. These may take a little longer, but will result in long term health for your skin and your whole body. My free eBook Clear Any Skin Problem Naturally offers a simple five step natural health and beauty program that gives you a blueprint to create radiant, healthy and blemish free skin. If you want a more detailed program that provides personalized, one to one nutritional consultation, I hightly recommend the Acne No More treatment program which is the most popular program on our site, and provides you everything you need to create a lifetime of healthy, acne free skin.